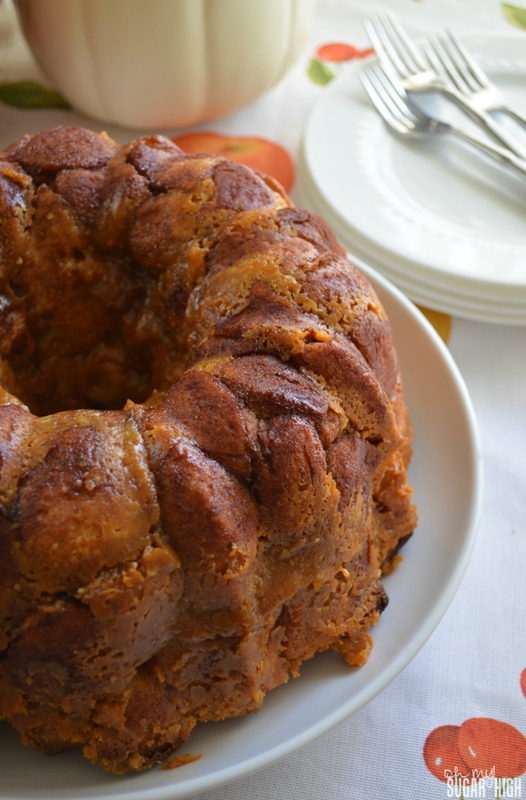 Last month, I spied with my “pumpkin always in my mind” eye, this delicious looking pumpkin cheesecake monkey bread recipe from Pillsbury. 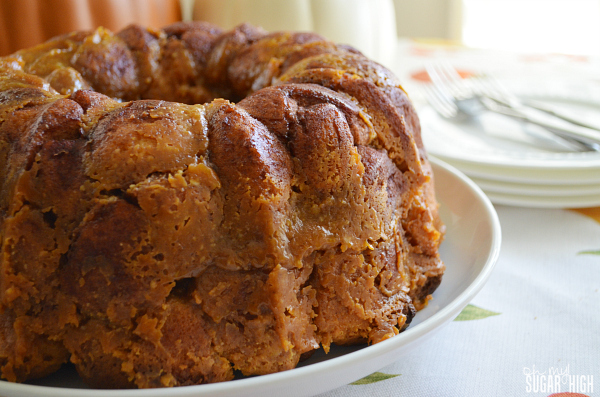 We love the more traditional monkey bread from Pillsbury, but I was looking for something a little different. Of course nothing beats my mom’s homemade monkey bread from when I was growing up. Unfortunately, I typically don’t have time to make the dough and let it rise so using Pillsbury refrigerated biscuits works for me. 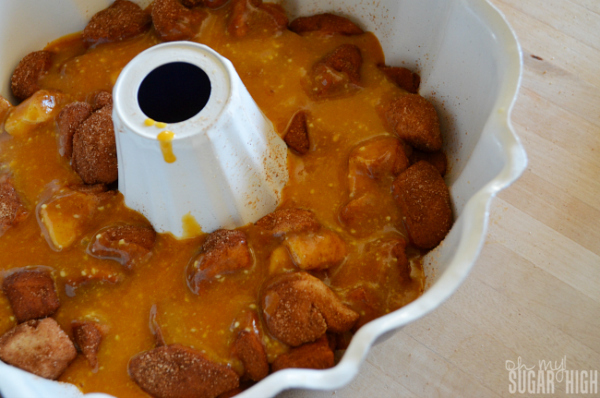 And since my family loves pumpkin and cream cheese, I thought this recipe would be a winner. It was! Preheat oven to 350°F. Spray 6-cup fluted tube cake pan or bunt pan with cooking spray. In large ziploc plastic bag, mix granulated sugar and pumpkin pie spice. Separate canned biscuits and cut each into 4 quarters. Add biscuit pieces to bag and shaking as you cut. When all biscuits are coated in sugar mixture, place half in pan. In medium saucepan, heat brown sugar, butter, pumpkin and cream cheese over medium heat, stirring occasionally, until butter is melted. Whisk until mostly smooth. Pour half of mixture over biscuit pieces in pan. Top with remaining biscuits. Pour remain pumpkin sauce over the top. Place pan on cookie sheet to avoid oven spills. Bake approximately 42 to 46 minutes or until golden brown. Cool in pan 2 minutes before placing heatproof plate upside down over pan. Turn both plate and pan over. Remove pan. Cool at least 10 minutes before serving. Store leftovers in refrigerator. I did make some changes to the recipe after reading some of the great suggestions in the comments section on Pillsbury.com. I love being able to hear from people who have actually made it, and in their opinion, made a recipe better. 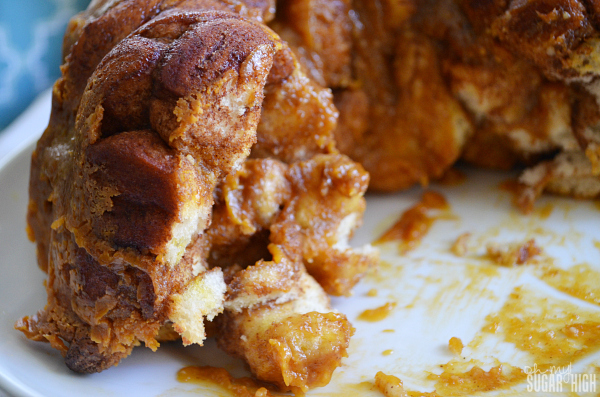 And according to my 8 year old, he thinks this monkey bread is “fantastic!”.